Hiya everyone! 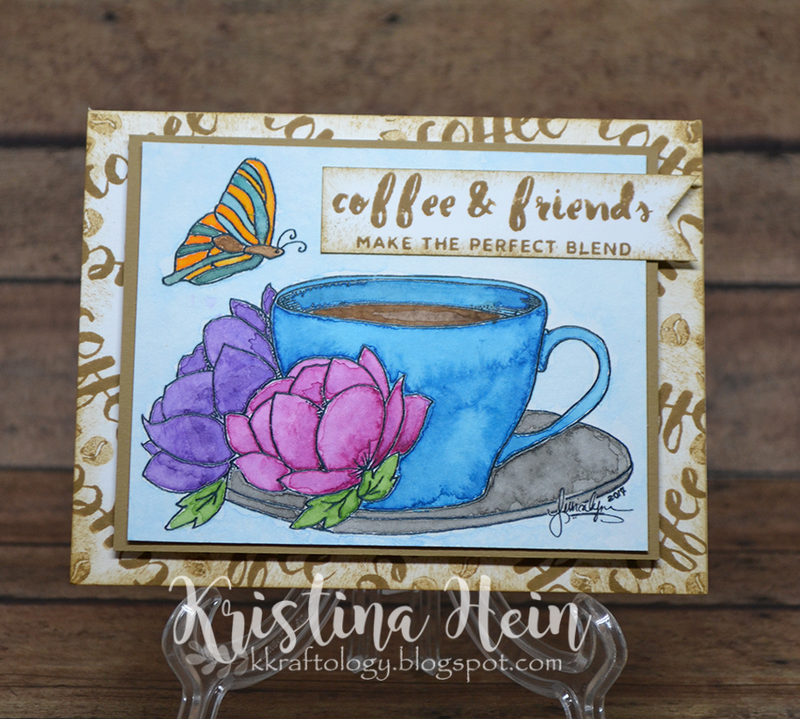 I am so excited that the next Coffee Lovers Blog hop has arrived. I've got a busy scheduled coming up this week so I knew I needed to make something today. I realized I had several images that I had colored for the spring hop but never had the time to make them into cards. This was just the perfect opportunity! Without further ado, here are my entries! For this card I used the gorgeous Spring to Go stamp from Unity Stamps. I need to collect all of their coffee cup stamps. I really want the one with the cat on it! I tried to be very light handed when I colored the image in using Zig Clean Color markers and a water brush. The patterned papers are both from Doodlebug. 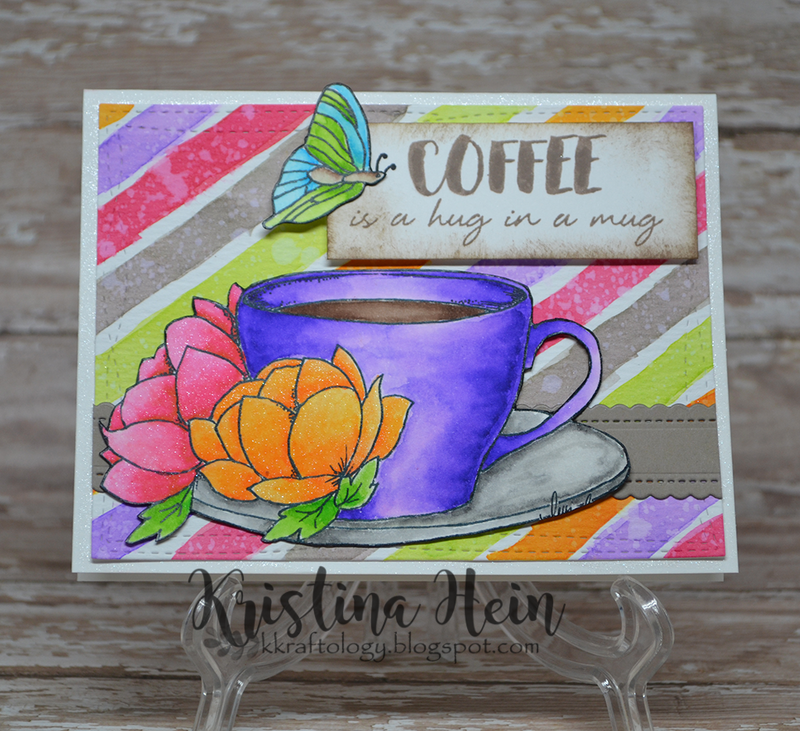 This is a digital stamp from Jessica Lynn Original stamp company. 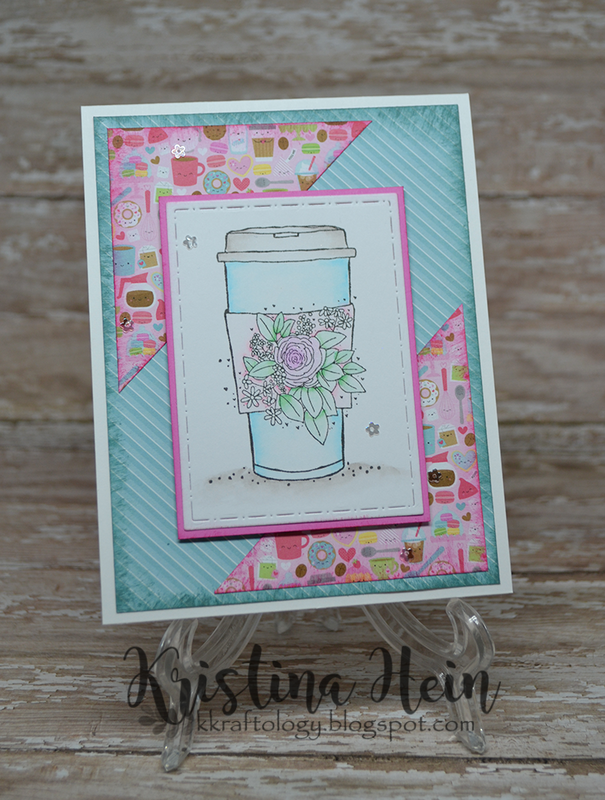 This was actually a freebie that I fell in love with from the Spring blog hop. In fact, I loved it so much, I colored it up three times. For this version I used Albrect Durer watercolor pencils. The stitched frame is from Mama Elephant and the sequins are from my stash. They might be from Pretty Pink Posh. 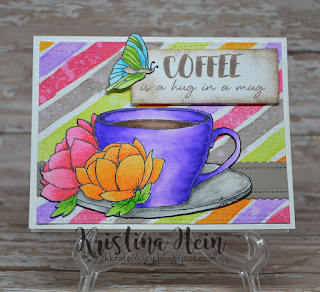 The sentiment is from Altenew's Coffee Talk set. Take number two on the Jessica Lynn Original digital stamp. This one I colored up using Mission Gold watercolors. It was my first time using them and it's not perfect but I love it anyways! 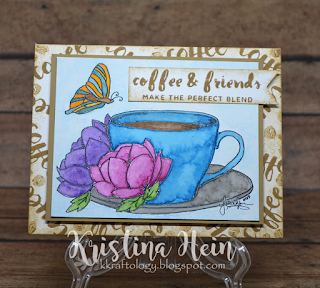 The sentiment is from Altenew's Coffee Love set. 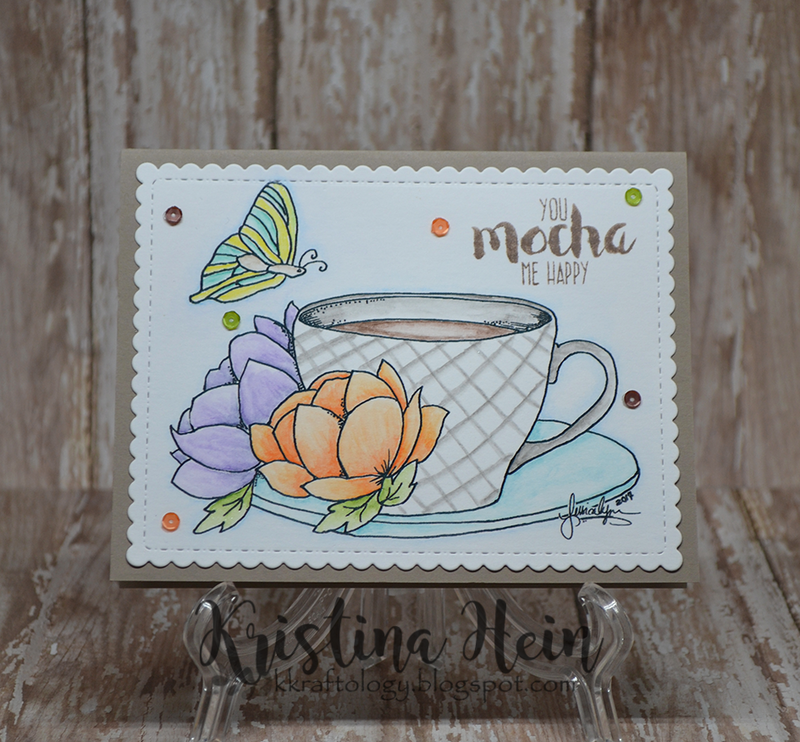 I also created the background using other stamps from the same Altenew set. 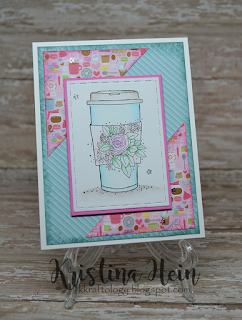 Third and final take on the Jessica Lynn Original stamp. I'm not going to lie. This version is my favorite! I colored it with Zig Clean Color markers. This one is considerably more bold than the image I colored from Unity Stamps. I couldn't find anything in my paper stash to match the vibrant colors. I dug out some matching colors of distress inks and painted some stripes on watercolor paper. Splattered it with water to give it texture and presto! Did I mention I love this card? 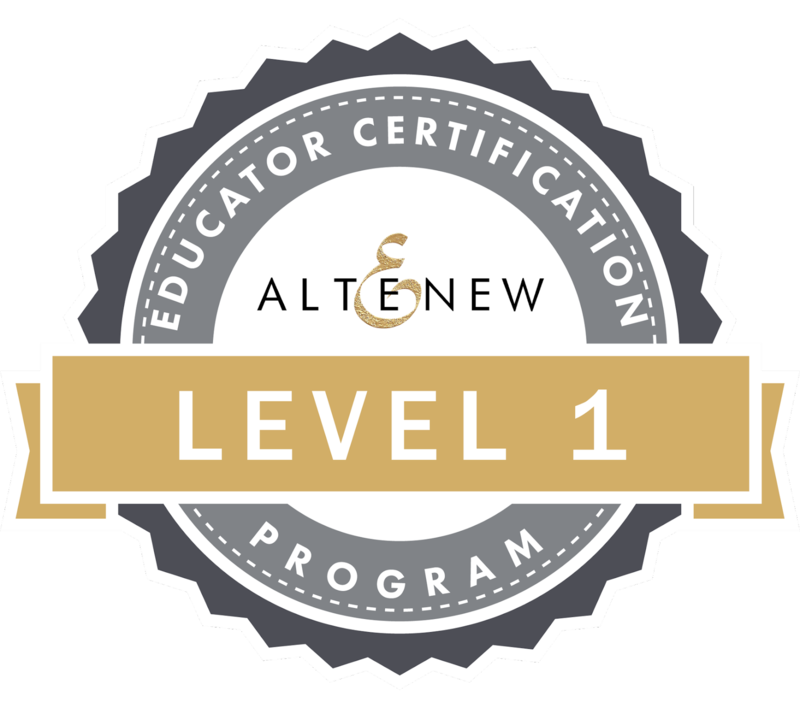 This sentiment is also from Altenew's Coffee Love. It's hard to see but I cut the stripe layer out using a Wonky stitched rectangle from MFT Stamps. The stiched scalloped edge is from Pretty Pink Posh if I am remembering correctly. Whew! A lot of pictures in this post and you can tell I had lots of fun making them. Thanks for stopping by! Oooh, these are all so beautiful! I love that you finished up images left over from the Spring hop...and colored them in bright summery colors.That Jessica Lynn digi is gorgeous and you did it proud! Oh yes, these are all so pretty! Love your coloring! Kristina, Wow! Great job on getting these made. Love the bold one too. Sylvia D.
Gorgeous colouring on all of these cards! Oh my, such lovely cards and all with flowers! These are all sooo pretty! That Unity cup is one of my very favorites!! And I love the pretty design you came up with. Oh, my! Lots of gorgeous cards. Wonderful job on all your cards! Gorgeous gorgeous cards! Love how different they are... awesome!